This fall 25 Citrus College freshmen from Monrovia began a mentoring program to facilitate their transition from high school to college, thanks to Judy Haugh, Citrus College alumna and daughter of the late Dr. Robert D. Haugh. The Haugh Scholars Program honors Dr. Robert D. Haugh, Citrus College's third superintendent/president, who served the college from 1967-1981. Under his leadership, the present Citrus Community College District was established, enrollment and diversity increased, the college expanded its programs, and new facilities were built, including the performing arts center that bears Haugh’s name. The Haugh Scholars Program is for Citrus College freshmen from Monrovia, where Dr. Haugh and his family were longtime residents. Throughout the semester-long program, the Haugh Scholars will attend seminars to facilitate communication and foster community. 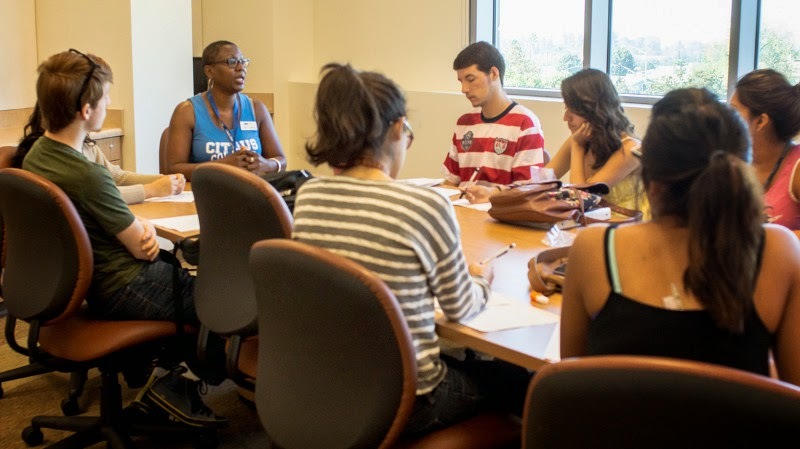 Seminars cover such topics as developing educational and career goals; applying for financial aid; accessing Citrus College’s educational resources; and transferring to a four-year institution. Judy Haugh provided input into the structure of the program. She is a longtime community college educator who recently retired as articulation officer and associate professor of counseling for Riverside City College.